Pata Yamaha Official WorldSBK Team’s Michael van der Mark sent the Dutch fans wild at a hot and sunny Assen on Saturday during Race 1 at Round 4 of the WorldSBK Championship. Riding at his home round, he recovered from a tricky SP2 to charge from seventh on the grid to secure his second podium of the season after a sensational ride at the TT Circuit Assen. It was a more of a mixed day for his teammate Alex Lowes. The British rider secured his maiden WorldSBK pole position after a stunning lap in SP2 but when the lights went out for Race 1, after a great start, it became obvious something was not right. Unfortunately, through no fault of his own, the wrong front tyre had been fitted to his R1 on the grid, which meant that after five laps he simply had no grip. Despite this, he battled bravely to bring his Pata Yamaha R1 home in a creditable 12th place. Van der Mark loves racing in front of the Dutch fans at Assen and it always seems to bring out the best in the 25-year-old rider. After ending Friday’s practice in third overall, he entered into SP2 confident he could fight for pole but a mistake on the qualifying tyre saw him miss out on the lap time he knew was capable of. Starting the race from seventh on the gird, the 2014 WorldSSP Champion made his usual lightning start and was up to fourth by the first corner. Remaining calm and focused, he set the fastest lap of the race on lap 2, picking his way past his teammate on the third lap to move up into second and then became involved in a race-long game of cat and mouse with Jonathan Rea and Chaz Davies. 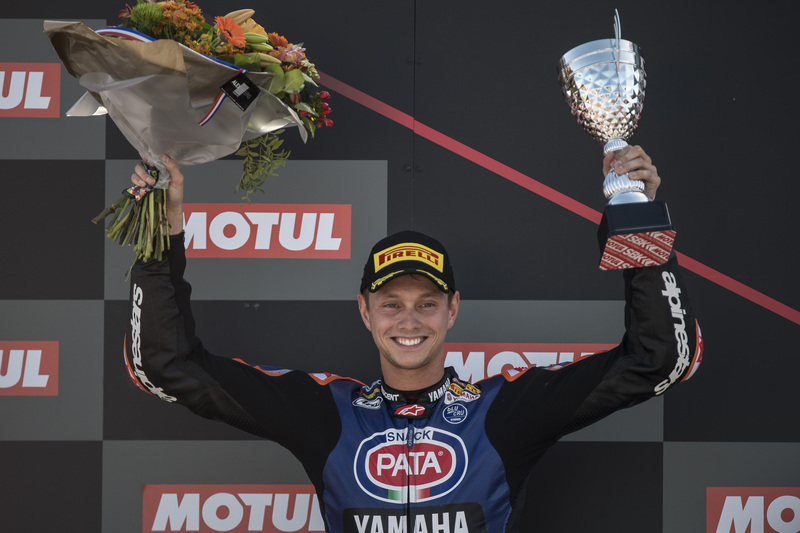 Van der Mark made the grandstand erupt when he made a classic Assen move on Rea at the Geert Timmer Chicane to take the lead and attempted to break away. Try as he might, he could not shake Rea and by lap nine, Chaz Davies had joined the party to make it a three-way battle for victory. A thrilling final few laps ensued, with van der Mark always in the hunt for the race win, matching Rea and Davis lap for lap. On lap 17 he blasted past Davies into second and tried to dislodge Rea from the lead but it was not meant to be. To the delight of the Dutch fans, the man from Rotterdam crossed the line in second, just 0.981s behind Rea to secure his second podium of the season and collect 20 championship points. The result sees van der Mark move up into fourth in the overall standings with 87 points, only 19 points behind Marco Melandri in third. Knowing he has the pace to fight for the win, he will enter into Sunday’s Race 2 with the mission of going one better and aiming for his first Yamaha victory from eighth on the grid. Lowes ended Friday’s practice in fifth and felt good on his Pata Yamaha R1 during Saturday’s morning FP4 session, which saw him enter into SP2 full of confidence. After his first run in the 15-minute qualifying session, he was lying in third having set a 1:35.163, but the best was yet to come. On his final run, Lowes showed supreme speed and commitment, to set a 1:34.066 and take his maiden WorldSBK pole position in superb style. Unfortunately, that was the highlight of Lowes’ Saturday. When it came to Race 1, there was a suspected problem with his number one bike which could have caused a safety issue, so he was given official permission to switch to his second bike. With both machines prepared identically, this was no issue for the 27-year-old British rider but, unfortunately, somehow there was an error on the grid and the wrong compound front tyre was fitted to his Pata Yamaha R1. When the lights went out, Lowes was battling at the front and had the pace to fight for victory but after five laps, he suffered from a drastic loss of grip due to the softer compound of his front tyre. As the race went on, the grip levels became progressively worse and it was a heroic effort from the 2013 British Superbike Champion to ride around the issue and bravely bring his R1 home in 12th place. Knowing he has the pace to fight at the front, Lowes is looking to forward to bouncing back in Sunday’s Race 2 and mounting a podium challenge from 10th on the grid. The four points he secured in Race 1 means he is now seventh in the championship standings with 74 points, just 2 behind Tom Sykes in sixth. “Well done to Michael and his crew – what a race! Qualifying was disappointing for Michael but the way he responded from the start and in the early laps was fantastic, and then to battle for the win over full race distance with the Championship’s key protagonists was super-impressive. The R1 worked superbly well and especially in the fast, flowing corners Michael and the Yamaha were very much the package to beat. There are a couple of key points on the track that we need to improve just a little and, if we achieve that, then Michael can again aim very high in Race 2 tomorrow. Thanks to him and his hard-working crew and engineers for giving Pata Yamaha a great result and getting ever closer to the victory we are targeting! Alex did an incredible and impressive lap to achieve his, and the new generation R1’s, first WorldSBK pole position – but unfortunately this was the high point of the day and things became a little more complicated after that. Shortly before the pit-lane opened for the race, the team diagnosed a suspected fault that could have created a safety issue and we were forced to change, with the FIM’s permission, to the back-up machine. This bike was perfectly prepared and, despite the stress caused by such a late notice change of machine, caused Alex no compromise to the performance. However, due to a team error, the incorrect compound front tyre was unknowingly fitted on the grid and, after only 5 laps, Alex knew he was in trouble. The tyre became progressively worse and rendered the R1 almost un-rideable as the race progressed – we have to thank Alex for bringing the bike home in the points and for his supportive, mature attitude after the race. As Team Principal, I apologise to Alex and to Yamaha for letting them both down today. We will recover from this and move forward positively as a team, starting tomorrow.